ONLY CLEAN THE BEER LINES ONCE EVERY MONTH!! We are appointed agents for the supply, installation and maintenance of the Patented BeerSaver™ Microbial Inhibitor System created by Cambridge Scientific Solutions Ltd. The BeerSaver™ System is the only scientifically proven and fully documented Microbial Inhibitor System in the Market. 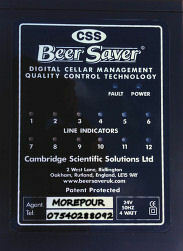 This system will reduce your Beer Wastage by 75% and help you to achieve consistency in beer quality. 4 weeks free, no obligation trial of the unique BEERSAVER system, huge savings to be made! Guarantees 4 weeks between the usual weekly beer line clean. Saving you the cost of the beer that is usually thrown away each week, time, line cleaner and water. The system consists of a flexible coil contained within the beer pipe leaving the keg connection. The coil carries a very low voltage radio frequency that inhibits the growth of yeast and bacteria in the beer, this reduces having to clean the beer lines from once a week to once a month, or longer in most cases. The free trial includes a professional line clean as part of the service. Morepour specialises in draught beer, wine and soft drinks dispense equipment, installation and maintenance within the South East and London areas. Our service area includes the following; Aylesbury, Battle, Barwell, Brighton, Bexhill, Bournemouth, Bognor Regis, Chichester, Crawley, Croydon, Dartford, Derby, Eastbourne, East Grinstead, Gatwick, Guildford, Hailsham, Hastings, Haywards Heath, Horsham, Horley, Leicester, Lewes, Littlehampton, Leeds, London, Maidstone, Milton Keynes, Kingston upon Thames, Manchester, Newcastle, Newhaven, Nottingham, Oxford, Portsmouth, Reading, Romsey, Seaford, Slough, Southampton, Tonbridge, Tunbridge wells, Worthing, Winchester and surrounding. Supplying brewery dispense technical services to Hampshire, Kent, Sussex and Surrey. Soft drinks dispense solutions and rent a keg service. We can provide everything that you require to dispense draught keg or cask beer (real ale). Please feel free to contact us for more information about the installation of beer coolers, pythons, pumps, fonts, taps or equipment for temporary mobile bars and beer festivals. Morepour - Brewery technical services, drinks dispense and mobile bar specialists. Draught beer keg equipment available to hire all year round, we can supply taps, pumps, coolers and gas equipment. We also have real ale (cask) cooling equipment and racking. We provide cellar technical services for installations and repairs of beer taps, coolers, pythons and most other drinks related equipment. Beersaver and Craft beer. Cellar Cooling, air conditioning, ice machines and bottle fridges, installed maintained and repaired. Morepour brewery technical dispense services. Powered by Blogger.